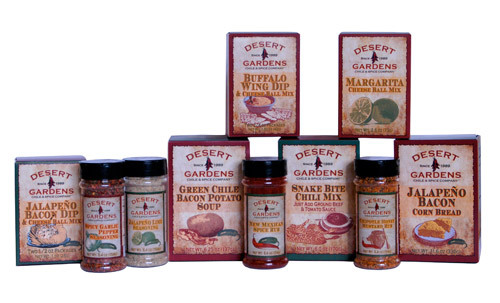 ALBUQUERQUE , NM – November 2, 2011 – Just in time for the holiday season, Comfort Foods, one of the nation’s leading specialty gourmet food manufacturers, has unveiled its Terrific 10 series of unique seasonings, party mixes, soups and breads. The products offer people a taste of New Mexico’s hottest flavors. The Terrific 10 emphasizes bacon – “Bacon is hot, hot, hot right now,” explained Mark Harden, Comfort Foods CEO. The Terrific 10 include Buffalo Wing Dip & Cheese Ball mix, Jalapeno Bacon Dip & Cheese Ball Mix, Margarita Cheese Ball Mix, Jalapeno Bacon Corn Bread, Green Chile Bacon Potato Soup, Snake Bite Chili Mix and four spices – Chipotle Honey Mustard Rub, New Mexican Spice Rub, Spicy Garlic Pepper Seasoning and Jalapeno Lime Seasoning.